Welcome to Evans and Sons Auto and Vehicle Towing, the most trusted full-service Utah towing services company for car towing, roadside assistance, vehicle removal, and off-road recovery. If you’re in Utah, no towing job is too big or too small. We provide a wide range of services from simple car towing to vehicle towing, including: recreational vehicles (RV’s), campers, off-road vehicles, and more. Our tow truck drivers are highly trained, skilled and certified professionals, with years of experience. They’ll help you get on your way in the fastest time possible and without damage to your vehicle. Over the last 10 years, Evans and Sons Auto and Vehicle Towing has built a reputation for providing the fastest response time and most reasonable towing charges you’ll get from any Utah towing company. We value our reputation, and your business. So when you work with us, you can be assured you, and your vehicle will be treated with care and respect. 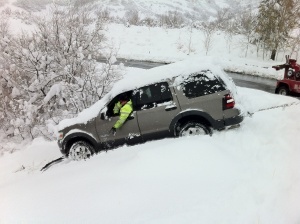 With the ability to take care of your towing needs or vehicle removal options anywhere in Salt Lake City and the surrounding regions, Evans and Sons Auto and Vehicle Towing is your best source for a Utah towing company. If you need towing help in Utah, call us today at (801) 975-9422 for all your roadside emergency service and vehicle towing needs.